Earn $14.55 in Rewards credit (1455 points) What's This? Light enough for XC, strong enough for freeride. Race Face designs the SIXC using Optimized Carbon Technology, resulting in a bar that's astonishingly lightweight yet amazingly strong. These bars provide 8 degrees of rearward and 4 degrees of upward sweep with 3/4 of an inch (20mm) of rise, and with a starting width of 785mm and minimum of 710mm, they can be adapted to many bike setups. With an eye on strength and dependability, the clamping areas for the stem and lock-on grips are reinforced, and Race Face say they run daily tests, from each product run, for durability and consistency. Marked off measurements at the end of the bars to facilitate cutting to size if you choose to do so. 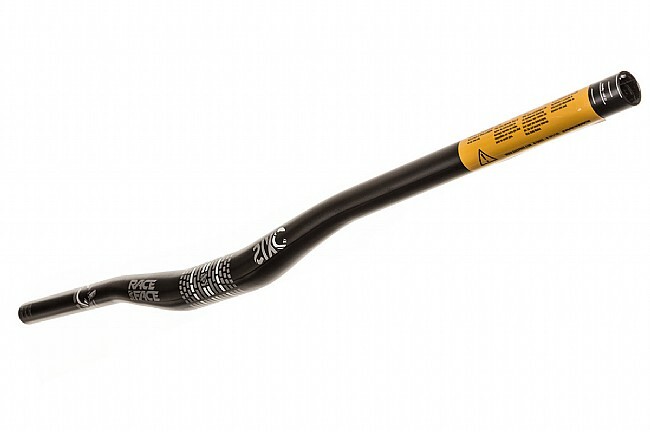 The Race Face SIXC Carbon Handlebars are available in Black with Silver/White decals, the SIXC Carbon Risers are 785mm with 8 degrees rearward sweep, 4 degrees of upward sweep, and a 3/4 inch rise. The bar clamp is 31.8mm and they have a claimed weight of 220g.